Magenta and Mustard Color Art Silk Jacquard Lehenga saree with Zari, Resham embroidery with stone work and patch patta Work. Paired With A Contrast Green Blouse. As shown blouse can be customized upto 42 Inches due to fabric limitation. Blouse Shown in the image is just for Photography purpose. Traditional kantha embroidery on a light tussar silk.The tussar silk is 60grams in weight. We offer a wide array of Embroidered Silk Sarees, that comes with varied captivating color combinations. These embroidered silk sarees come with enchanting cut work and feature flawless finish. Apart from this, their superior finish provides comfort to its wearer. Real magnificence will come out from your attire when you wear this cream and black art silk and cotton jacquard half and half saree. This saree is prettified with brilliant embroidery and patch border work makes it fabulous. It comes with matching blouse. 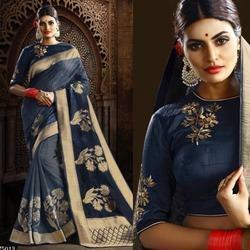 We are engaged in offering Embroidered Tussar Silk Saree (1043) that is designed using optimum quality fabric. These are appreciated for their unique designs & patterns at the pallu, along with unique patterns. The designers carve unique blouses that are in compliance with the saree. Further, these can be tailored as per the requirements of the clients.